There is something about drinking alcohol that makes me want, or shall I say need, to eat salty, greasy, cheesy food. And since I’m usually waiting in a line 20 cars deep for my Taco Bell on a Friday night, I know I am not alone in experiencing this strange phenomenon. After four years of college, I am led to believe that there is a direct correlation between alcohol consumption and uncontrollable raging hunger. And I am furthermore convinced that drunk hungry is the highest form of hunger that exists. You crave things that normally repulse you (ever seen that Taco Bell meat sober? ), and you eat portions of food that could probably feed a family of at least four (fast food bills topping $20 are not okay, considering that each item is around $1…as a general rule of thumb, you should never consume more than $5 of fast food in one sitting). Now, I had recently managed to curtail my drunk eating habits, not by choice, but because the line at the Taco Bell near my house literally got too long to wait in a cab for. Drunken college students take forever deciding what to order, and that meter just keeps on ticking away. I didn’t have the time, money, or patience for my fast food indulgence, so for several weeks I went to bed with the spins and a growling belly….miserable combination. Then I discovered—drumroll, please—Sir Pizza, which is open until 2 am and regrettably located within 50 feet of my apartment. I say regrettably, because now the only thing on my mind at the end of the night is gooey, cheesy, totally bad for me, and conveniently located at my doorstep. I have to actually smell the fresh pizza cooking on my way from the cab to my apartment. It is a sick joke…like dangling cake in front of a fat kid. Consequently (and as expected), I have ended the past three nights shoving Sir Pizza to my face. My favorite thing to order (aka the only thing to order) is the Large Veggie Pizza with a side of Ranch. The side of ranch is crucial, because Sir Pizza has a little bit of a sweeter tomato sauce (which I don’t like) and the ranch helps cut that sweetness. So yes, you are dipping the entire slice—not just the crust—into the ranch. Ohh, and the greatest part about Sir Pizza is that there really is no crust, because the toppings go all the way to the edge of the pie. I personally, never eat my crust, so this just maximizes the amount of pizza I can eat! 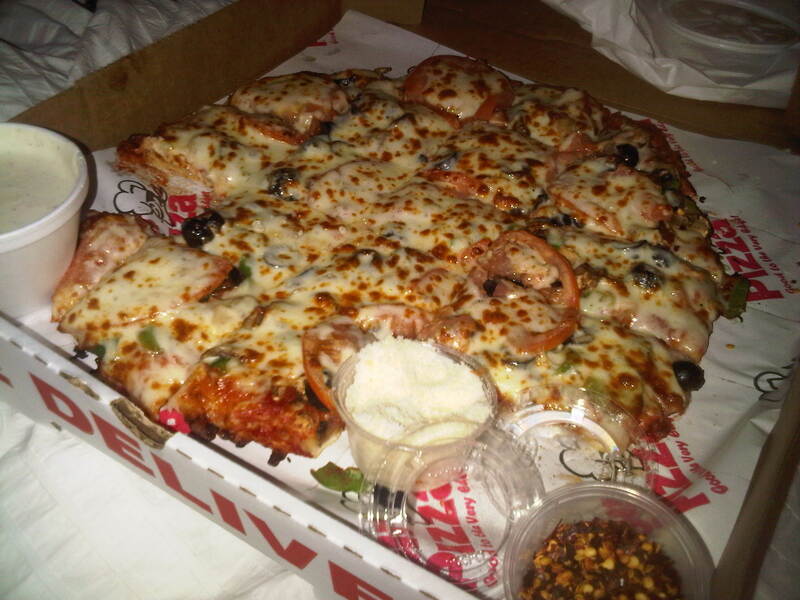 The veggies on the pizza include; black olives, green pepper, Spanish onions, mushrooms, and tomatoes. If you can’t find someone to share the pizza with you, it is also available in a smaller 10-inch size…but I say, go big or go home! My favorite part about the pizza is that it is cut into little squares. Each square is about 3 bites worth of pizza, so you can guiltlessly enjoy several slices (it also makes the pizza much easier to handle…especially when drunk!). Jen and I woke up every morning this weekend with a Sir Pizza box on the nightstand, and I must admit that it is a refreshing change from Taco Bell. My stomach and my clothes both appreciate the break from the ravages of Fire Hot Sauce. Ohh, and if you’re too drunk to do anything but eat, don’t worry, because Sir Pizza does delivery! I must shamefully admit that there have been occasions when I have paid to have my pizza delivered the whole 50 feet across the parking lot to my apartment. There is nothing better than having your indulgent drunk feast brought to you, while you lay in bed! 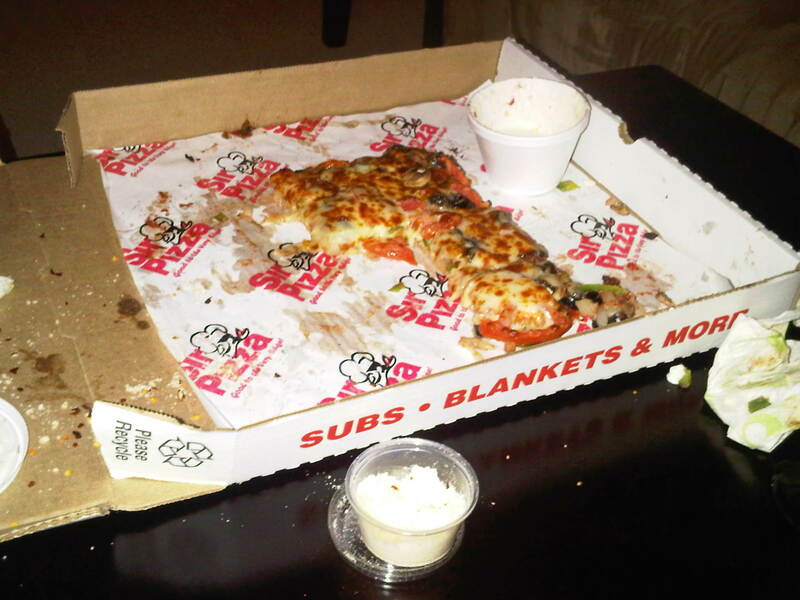 All that is left of Sir Pizza 20 minutes later!